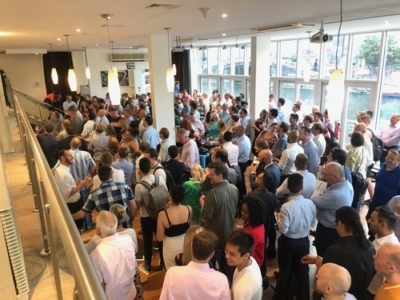 Thank you to everyone who came to the Head for Points Summer Party on Monday, at the Holiday Inn Camden Lock. We had just under 250 people there. 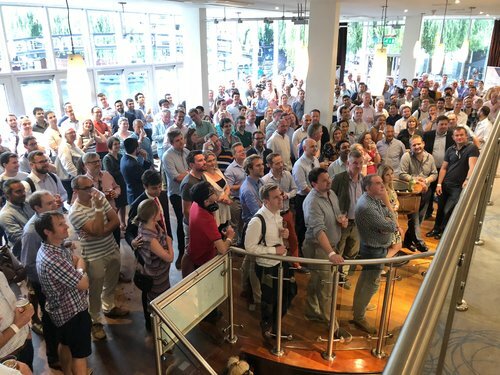 I was a little nervous about having such a big group – our Christmas events have always been capped at 150 – but the feedback I got is that it worked out well. Once I got my head around the fact that I couldn’t speak to everyone (at Christmas I have always tried to say Hi to each guest, but it is easier with just 150) it was all fine. The bar was busy but manageable, and once people had redeemed their free drink voucher quite a few realised that they could nip out to the quieter lobby bar, buy a drink there and then bring it back. I need to thank Etihad Airways for their generous support of the event. Not only did they fund the free drink vouchers, but they also provided a couple of people to help Anika run the reception desk. They also went well beyond what they originally suggested to us in terms of raffle prizes. Having the Etihad marketing material around the room also made it feel more like a frequent flyer event than it would have otherwise. Here a few photos from the evening. Unfortunately Jamie, who usually does our photos, is currently out in Montenegro on a super-yacht, as you do, and Anika and I were so busy we didn’t get too many opportunities to snap away. This shot shows the outdoor terrace and Camden Lock beyond – this area was rammed all evening, it is only quiet here because the speeches were happening inside. It was slightly bizarre watching ducks swim past. As long as he flies an A380 from Heathrow, Max will get to experience the impressive Business Class Studio which I reviewed here and am very positive about. The seats turn into fully flat beds up to 6 feet 8 inches long, the IFE screen is huge 18 inches and Business Class passengers have access to the bar which is designed to have the feel of a Mayfair private club. ….. and there were a good number of people who were clearly drawing their pensions and then blowing it on luxury travel (which I strongly recommend!). 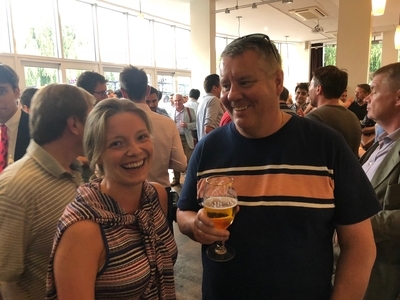 Thank you to everyone who came along, especially those who stuck it out and bravely followed Anika down to her favourite sticky-floored Camden pub afterwards …..
PS. If you are an SME owner, you can find out more about BusinessConnect, Etihad’s free small business loyalty scheme which was discussed in the speeches on Monday night, on the Etihad website here. Would you consider doing a non-London based event. Appreciate that if you are to have a single annual event it should be in the capital, but if you’re having two, maybe this can be elsewhere …a different location every year for the summer party? Birmingham, Manchester, Leeds??? It’s just the ability to attend a mid-week evening event in the capital is limited for those outside London and I’d suggest your reach extends far beyond the capital! Watergate Bay near NQY isn’t too bad. Try explaining that one to my wife …. She seems to enjoy these events as much as the next (wo)man! We would do it if all the non-London readers lived in the same place. Because the truth is that if you lived in Leeds and we did it in Birmingham, you probably wouldn’t come – esp for a 6pm start. Bt thought it okay or a good idea to hide thier AGm in EDI yesterday. Do it in Crewe then. Connected by train to pretty much everywhere, and you can be back in London in 90 minutes. Looked great fun Rob. Any chance you guys might consider the Christmas party tickets being allocated via raffle system of some sort so everyone has an equal chance of getting a ticket? This may be an administrative nightmare to manage of course as I guess everyone who won would have to be contacted for ticket payment. Though I’d be happy to help out to reduce the administrative burden on you and Anika if something like this was a possibility. We might do. We have looked at selling unlimited tickets and then refunding at random to get down to the right number, which is easier admin wise in theory, but Eventbrite doesn’t make such a process (selective bulk refunding) easy. You could set up a raffle for early access tickets purchasable in an invite only event then after a certain deadline open unclaimed tickets publically on first come / first serve? Gives everyone a chance via the raffle and lets the dedicated sit there with fingers on mice if they miss out via raffle. Manually chasing 250 people, and receiving manual bank account payments, is simply not feasible. Anyway, I had a meeting yesterday with one of the big London hotel groups and they are going to look at finding us a suitable space on a financial deal we could live with. The Oval, oddly, has also offered us a venue. Or even more commercially, £50 per head for the first 50 tickets, then £30 for next 50, then £10 each etc. Would take all the fun out of it though. There was no way I could have got a ticket this time even though I could have travelled, as I was stuck with clients all day till 5 o’clock. It would be nice to have still had a chance but I don’t know what the solution is. It was only the summer party though so I wasn’t that fussed. If I had been free for the winter event and had missed out though, I might be looking for a solution. I can imagine given the demand you’ll have that Eventbrite won’t like that as they have to pay transaction processing fees – twice – for everyone you refund. Perhaps a similar situation where you give the selected ‘winners’ X hours/days to pay before moving on to someone else could work. I always thought they got a refund of transaction fees when processing a refund – not charged double? That’s a good idea though – giving X raffle winners a secret link to buy tickets (if technically possible?) then just selling whatever is left as normal. We can do that, but we’d still need to manually draw 250 raffle winners and manually email 250 people. And since people would have the choice of buying 1 or 2 tickets, it would add additional complexity. To some extent it will depend on raffle prizes. If we end up with big goody bags, 25 £100+ raffle prizes again and a big ‘star’ prize we will think more carefully about how we allocate tickets. If it is a more straightforward drinks party then it isn’t as important. Organise a meet up yourself? True had thought about that – Brighton area anyone else..? Leading on to…. in the interests of gender balance can 50 percent of the tickets for the next party please be reserved for women.